Another empties post – and it’s another box of empties that are mainly shower stuff! Well, what can I say… at least it means that I like to be clean! A bath salt I’ve repurchased several times, mainly because it’s cheap. It’s about 5 euros for a 1.3kg bottle, which is price that’s really hard to beat. This took me so long to use up; I like it – it left my hair feeling really soft and smooth after using, but it also felt a little heavy and weighed down my hair. I love this showergel – it smells wonderful, very citrus-sy. The husband is obsessed with this brand so I guess we will be purchasing a lot more of these. Another showergel that smells really nice – this is more floral, but the scent is not as strong. It’s quite a nice showergel though; doesn’t leave the skin feeling dry. The very last bottle of the set of 10 that I bought. I feel really sad now that I’ve run out of these oils but they’re just too expensive to purchase without a discount. I got these hoping that they will be a cheaper replacement of the Aromatherapy Associates oils – but unfortunately they’re nowhere near as good. These are a lot less moisturising, do not feel like a luxurious bath at all, and the scents are distinctly more herbal. This is supposed to help refresh, purify and revitalise the skin; I’m not a fan of this as this smells rather weird, not the floral rose scent that I was expecting. Hands down my favourite sunblock ever. This comes in a mist form – the mist is so fine and wide-spread; I wish all mists were made like this. It’s not sticky at all, extremely lightweight and does not leave a white layer on the skin. However, it’s also one of the most expensive sunblock I’ve purchased in a while, especially considering that it was used up very quickly. That’s all the empties for this fortnight! 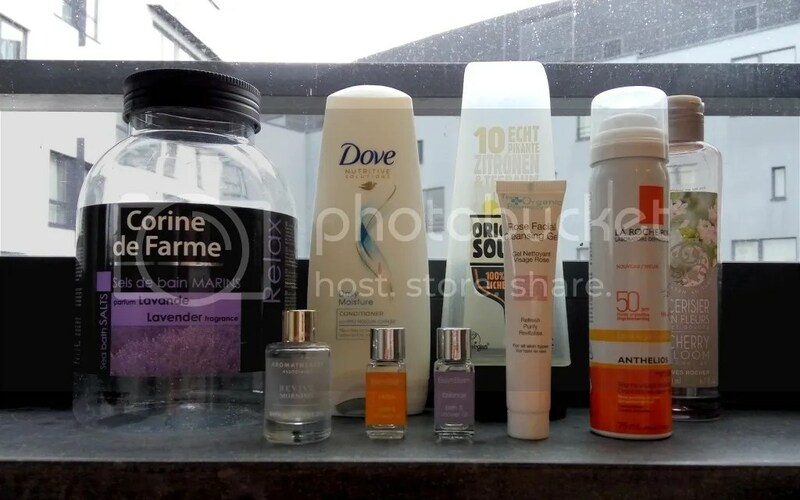 The thing about writing empties posts is that it not just shows me what I’ve used and what I felt about them, but also reminds me about the things that I haven’t been using! I’ve been a little slack with my face creams lately and body moisturisers, so I will be making sure that these are by my bedside from now on! Have you used up anything this month?